In my opinion the new location is awkward and the statue should really face away from the Spire which blocks the view. If you examine my photograph the fingers look as if they are missing and according to a local historian many of the fingers had been vandalised many years ago ... I do not know if that is in fact true. 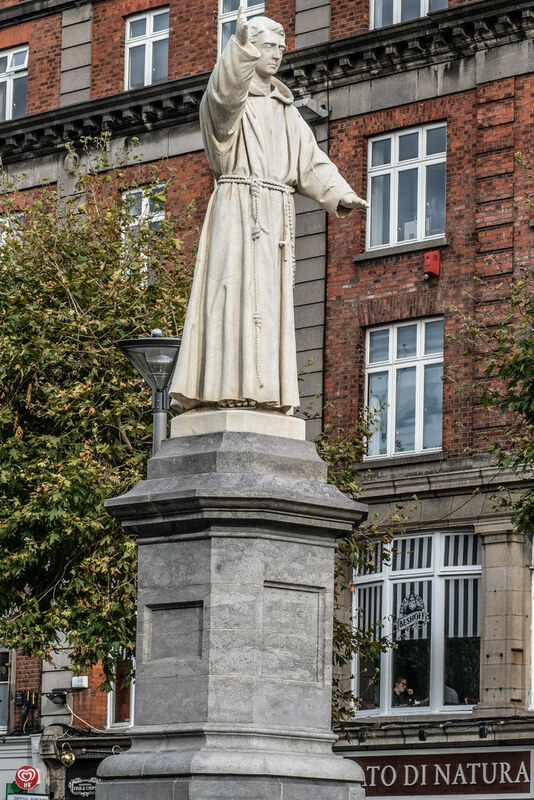 Back in 2014 the following headline appeared in the Irish Independent "124-year-old Fr Mathew statue needs a new home due to Luas". 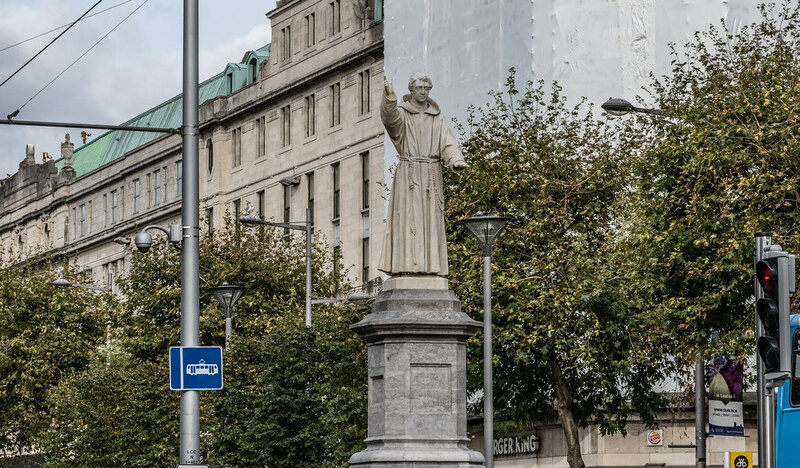 To facilitate the alignment within the central median of O'Connell Street Upper, the Fr Mathew statue was removed in 2016 by a heritage contractor. The statue was delivered to a secure storage facility where close assessment of the condition was carried out. This examination showed that the statue was in excellent condition and would require only some minor conservation works before reinstatement. 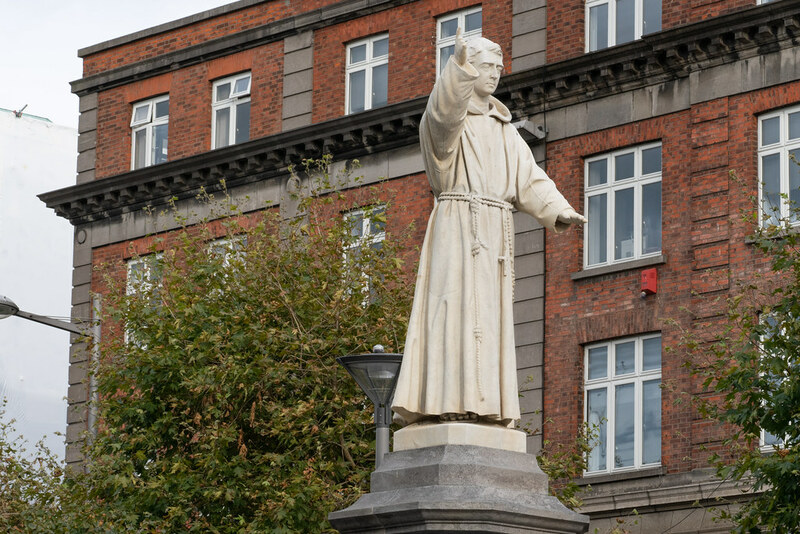 LCC had lengthy discussions with Dublin City Council and the Capuchin Order with regard to agreeing an appropriate new location within Dublin City Centre for the reinstatement of the statue. About 19 different locations were considered before the decision was made some months ago to return the statue to a new spot on O’Connell Street. This fine memorial statue and its elaborate stone plinth is of evident artistic value and makes an important contribution to the surrounding streetscape. Its importance is enhanced by the contribution of the Temperance Movement to the social history of the country and its citizens following Catholic Emancipation and given a further, international dimension by the part played by the movement in the acceptance and assimilation of Irish immigrants into society in the United States.